Labor groups urged massive clothing retailers including Gap and Wal-Mart to sign an international pact this week that would solidify safety standards and send a clear message that big brand names won't allow another easily preventable tragedy like last month's factory collapse in Bangladesh, which killed over 1,000 people, to happen again. Naturally, most U.S. companies that produce in Bangladesh refused to sign it. By Wednesday, more than a dozen European retailers had signed the pact introduced by IndustriALL (a global federation of unions), including Benetton, Topshop, Zara and H&M. But Abercrombie & Fitch and PVH Corporation, the parent company of Calvin Klein and Tommy Hilfiger, were the only U.S. companies that got on board; others said the language could get them into trouble. Which, duh: that's exactly the point of an agreement that holds companies accountable. This five-year pact makes sure that retailers who source clothing from Bangladesh pay for independent inspections, mandatory building repairs/upgrades and training. It also requires companies to stop working with factories that refuse to comply with necessary upgrades, and ensures that workers and unions aren't left out of the process. If these companies care about worker's rights — as they so often claim they do — why won't they sign? The company said Tuesday that it'll oversee its own public, "in-depth" safety inspections at the 270 Bangladesh factories it uses within six months. According to Wal-Mart, Wal-Mart's safety plan is even better than the IndustriALL proposal and "will get results more quickly." Well, if Wal-Mart says so, it must be true! Gap sent a letter to employees at its headquarters on Wednesday, saying, “We take our commitment to improving working conditions in Bangladesh very seriously.” The letter said Gap had hired a fire inspector to examine the 78 factories it uses in Bangladesh and had promised up to $22 million in loans for factories to make safety improvements. A Gap spokesperson said it was "six sentences" away from signing on Tuesday; it wanted to remove language on arbitration. But IndustriALL wouldn't give Gap special treatment, so Gap didn't sign. The company told press that it was still evaluating the plan earlier in the week; it didn't end up signing. Sears spokesman Howard Riefs said late Tuesday that the company will continue with discussions, but is not ready to sign the union plan. He says the company also is in preliminary talks about the retail trade groups' alternative. 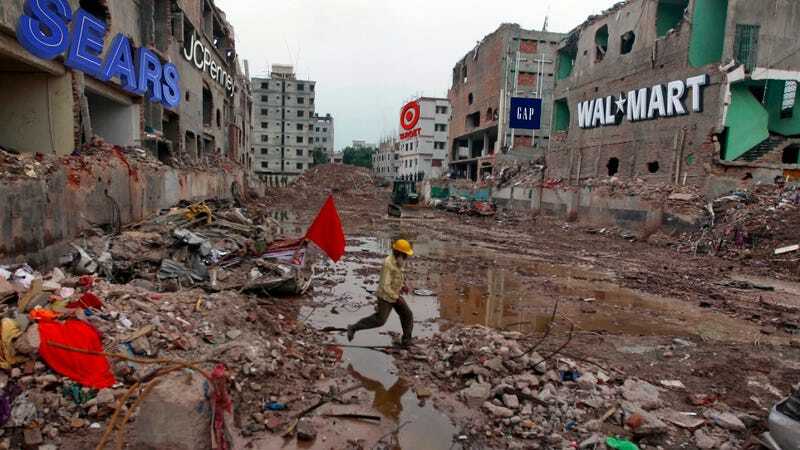 Meanwhile, Sears, which also owns Kmart, "will continue to assess the overall risks in each factory in Bangladesh that produces our merchandise, with added scrutiny towards fire safety and building integrity," Riefs said in an e-mail. "Factories that cannot reach an acceptable level of compliance with the requirements of our Global Compliance program will be terminated." Looks like we need a few more heartbreaking — and, again, very easily preventable — factory disasters to guilt the world's largest retailers into prioritizing their worker's lives over building new floors and producing cheap T-shirts.